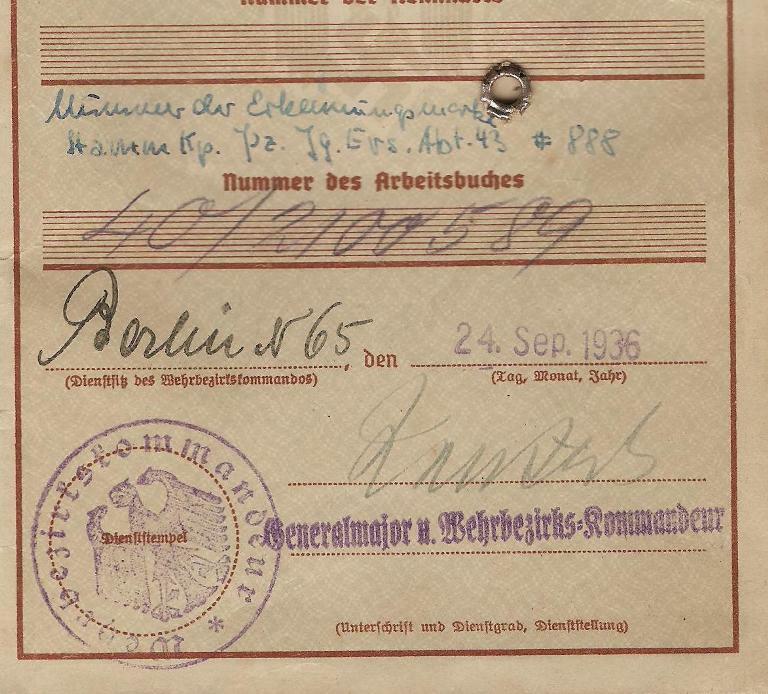 Please post your unknown Second World War Heer/Waffen-SS/Polizei signatures here. Generalmajor shown as Kommandeur Wehrbezirkskommando in Berlin in 1936. Unfortunately by the time the listings seen in Das Deutsche Heer 1939: Gliederung, Standorte, Stellenbesetzung und Verzeichnis sämtlicher Offiziere am 3.1.1939 were compiled none of the various Kommandeurs of the Berlin W.B.K's were above the rank of Oberst. 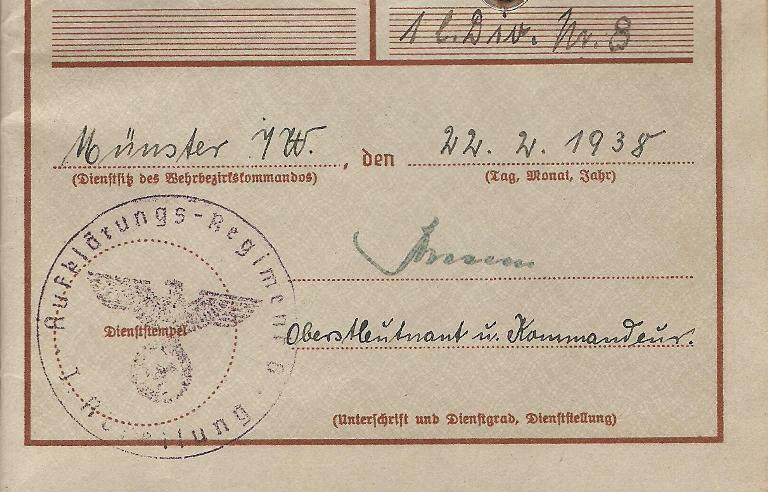 Stamp shows I Abteilung Aufkl.Rgt 6 and dated 1938 with the signing officer being an Oberstleutnant and Kommandeur (of the Aufkl.Rgt rather then the Abteilung I'm assuming). In the aforementioned book in the above post, the commander of the Abt is no higher then a Major and there is no mention of an Aufkl.Rgt 6 (unless I can't see it for looking). But under Aufkl.Abt 8 there is an Oberstleutnant in command with the name of Grolig and in brackets there is the notation (Aufkl.Rgt 6). 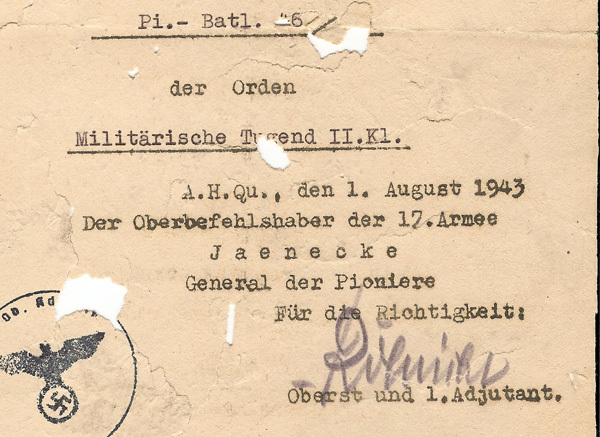 The soldier (an officer) whose WP this is did serve with Aufkl.Abt 8 from Oct 1935-Oct 1937 before going to I./Aufkl.Rgt 6 from Oct 1937-Nov 1938 (or was it a case of Abt 8 being renamed as the I Abt of Aufkl.Rgt 6?). Anyway, I can't see the name of Oswin Grolig in that signature but you never know I suppose where a squiggle is concerned! According to the Lexikon der Wehrmacht, Aufkl.Rgt. 6 was formed on 10 November 1937 with two Abteilungen: I./Aufkl.Rgt. 6 was the former Aufkl.Abt. 6 and II./Aufkl.Rgt. 6 was the former Aufkl.Abt. 8. This only lasted a year, and the regiment was dissolved, with the Abteilungen reverting to their old names. So the dates match up with your guy's career, but he may have also changed battalions. Thanks for that Dave - definitely not Grolig then! 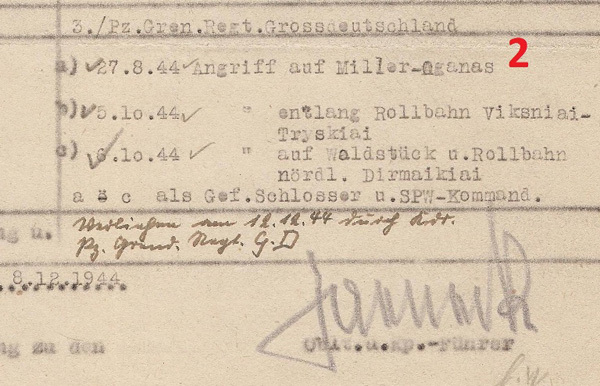 Aufkl.Abt 6 Kdr at the beginning of 1939 was Major Frhr von Eckhardtstein, and after his (the soldier whose WP it is) service with I./Aufkl.Rgt 6 he went to the Kriegsakademie in November 1938. 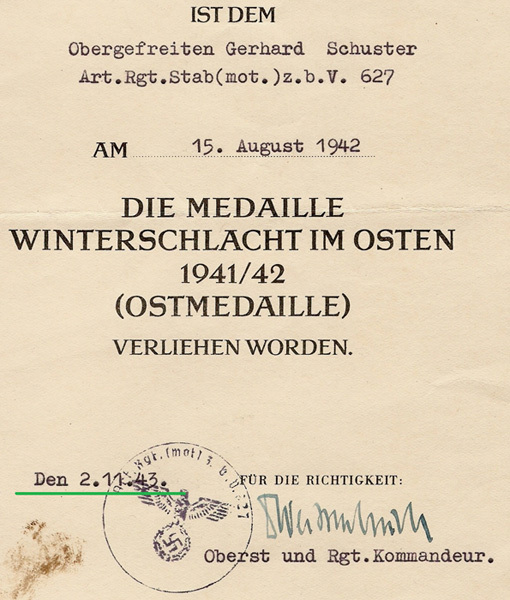 Whoever the Oberstleutnant is it could be assumed that if he was an Oberstleutnant in early 1938 he would of reached General rank (if he was seen as such material by his superiors) but of course there are probably loads who should of but never did for one reason or another, including death. 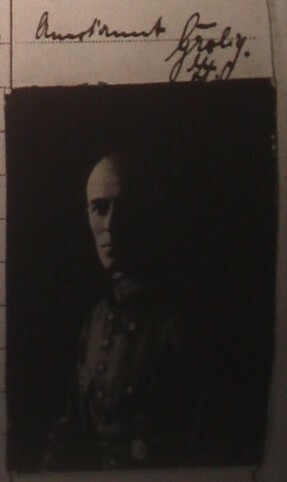 It looks like Obersturmführer Theobald. Once again, thanks for that. It always looks obvious once someone else has identified it! Unknown Hauptmann and Komapnie Kdr of 2./Pz.Rgt 8 and dated for late 1938. 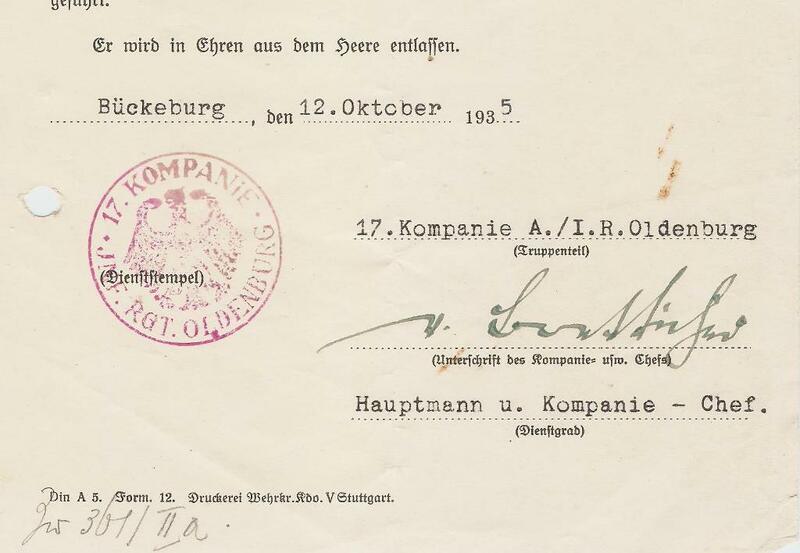 According to Das Deutsche Heer 1939 which was compiled for just a few months later, the Kompanie Kdr was Hauptmann von Hendebreck but I just can not see that name in that signature. Probably Hptm. 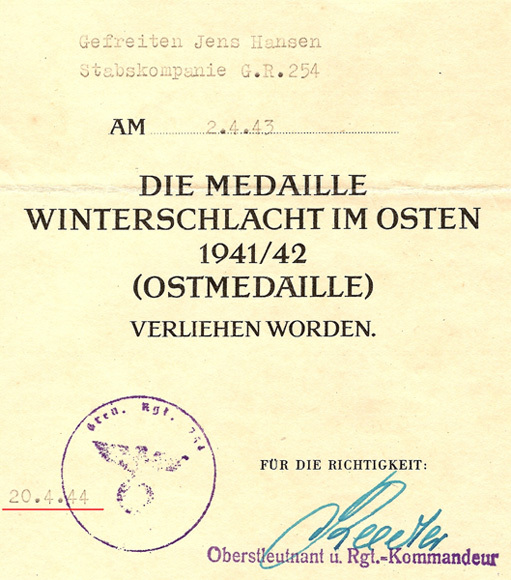 (later Maj.) Joachim Mittermaier. Thank you - can see that name in the signature. It does look like that. Just a pity that it is a very common name as it is proving impossible to tie down to an individual using Das Deutsche Heer 1939 and the Rangliste 1944/45. 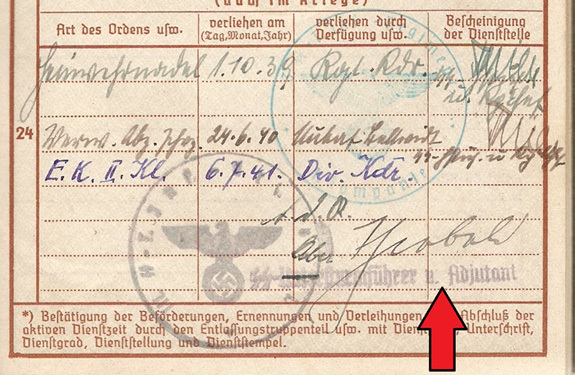 Hello, I ´m new here (but as "specialist" in german WW2-Army officers (Stellenbesetzung) I can help You a lot. Welcome to GMIC and any and all help you can provide the members will always be much appreciated. Thanks for the names. 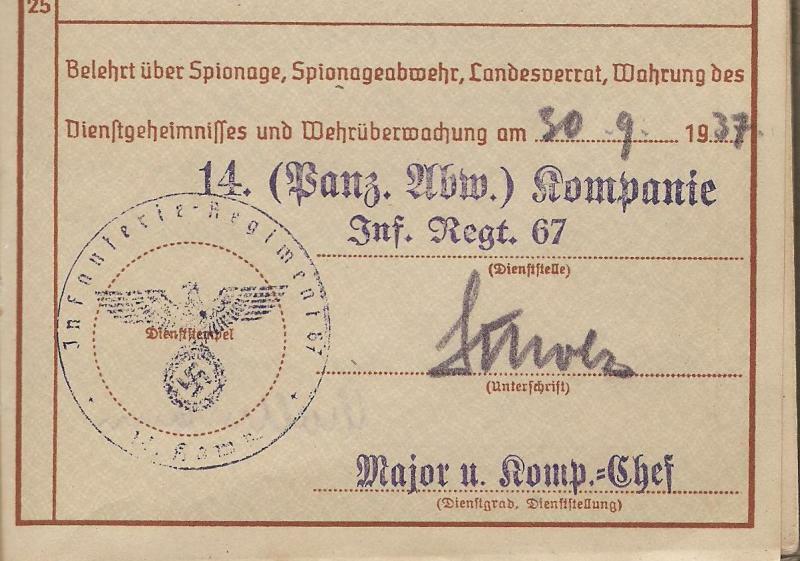 3) 13./Infanterie Rgt GD Sept 1939 to at least Jan 1940 - as an early Kompanie Kdr (with rank of Hauptmann) I thought this one would of been mentioned somewhere but so far I have drawn a blank.